It is spotless and exactly what you would expect from a Caribbean vacation!! The staff was outstanding!! They took very well care of us . The property was very nice and well maintained. The room was just okay, as well as service. The property was very inviting and clean! Our room was perfect and there was a hot tub on our balcony. LOVED IT! We LOVED Breathless!!!! We had a group of 9 people who stayed here for a 60th birthday. It was a party everyday and always something going on. You will not be bored here. Lots of music was played everywhere and everyone had a lot of great energy. We will return. When arriving to the hotel (early-12noon), we were able to check in, walk around, eat, and have some drinks while waiting for a room to be assigned. Once our room assigned, the luggage man walked us over to the room and the room was actually not ready once we arrived to it. The luggage man, was very nice and requested to assign us a room that was ready. We ended up being bumped up to an Exhale Room, which was great. Our overall experience at this property was good, However, my only complaint is the food. The food was terrible, even at 'The Strip,' this is the restaurant included for the Exhale Club members, otherwise you have to pay for it. Some of the employees would give us a hard time to eat at this restaurant, which was upset considering it was a perk included in our room. The Exhale Club, it's not worth purchasing, for those that are considering in purchasing it. I wish they offered Authentic Dominican food, which they don't and that's very disappointing. The food was very bland, no flavors. The only restaurant at this property that was good, was the Mexican Restaurant. This is a great place to stay. Would highly recommend the hotel. Our host Julia Roberts was amazing. Staff was amazing and very pleasant to deal with. The resort itself is nice but the food was not tasty. The best food came via room service and even that was sub par. As all inclusives go I’d say this ranks the lowest of each ones I’ve stayed at. Rooms were okay; not the cleanest but the beds were comfortable. There were drain flies in the bathroom daily. If you don’t know what those are, google them. Food was always room temperature or cold at all of the restaurants and buffets. We got sick on our 2nd day of our trip- not sure if it was the food or drinks. The symptoms continued until the day we left to go home. When checking out, we were told to leave our email and a comment. I made the staff aware of our GI symptoms and we were told to fill out a report and received a Gatorade. I noticed 3 people who checked out the same day as us also wrote “food poisoning/sick the whole week”. On a more positive note, the pool was amazing. They always had activities going on and the staff there was amazing! So friendly and outgoing. Overall I would not return to this resort because of the rooms and food but I plan to return to another resort next year! This hotel is in need of a facelift. The website provides these beautiful pictures and you could easily be deceived. Our room was decent, but there was paint chipping from the walls, it was extremely dusty, the toilet did not flush properly, the sink and shower did not drain properly. We also experienced hotel staff rummaging through our belongings. Our friends next door's bank card was stolen. Housekeeping kept coming to our room at odd times of the night. I didn't feel safe. The drinks were made with extremely cheap liquor and the food was blah. Although I'm aware this resort is located in a primarily Spanish speaking country, it made for a hard time explaining things to hotel staff. You could tell there hasn't been much upkeep and the resort is old. The staff was super friendly and helpful, too bad that isn't enough to cancel out the negatives. Let's start with my room, my room phone did not work, the curtains were dirty and the balcony and hot tub were filthy. I stayed there five nights and my balcony and hot tub were never cleaned. I went there with a large party, twenty three people total. More than half of us got sick. I couldn't leave my room for hours at a time because I could't be far from a toilet. Two of the people from my party have been diagnosed with gastroenteritis. Not sure if it was the food or something we had to drink. Nice resort. Room was not completely ready when we checked in. Mini fridge was not stocked. Wonderful time, my boyfriend and I spent 3 nights, and we loved everything about this hotel. Breathless Punta Cana Resort & Spa Adults Only All Inclusive places you 8.5 mi (13.7 km) from Macao Beach. This 750-room, 4.5-star property welcomes business and leisure travelers with 8 outdoor pools, a full-service spa, and a casino. Free buffet breakfast is served each morning from 7 AM to 11 AM. Relish the Asian cuisine at Silk City, one of 10 onsite restaurants. Savor a meal from the privacy of your room with 24-hour room service, or get a pick-me-up at the coffee shop/café. Guests can expect to find free WiFi and 32-inch an LCD TV with satellite channels. The bathroom offers a rainfall showerhead, hair dryers, and free toiletries. Other standard amenities include free minibar items, a furnished balcony or patio, and an iPod dock. Breathless Punta Cana Resort & Spa Adults Only All Inclusive features a full-service spa, 8 outdoor pools, and a casino. Free valet and self parking are available, and there's also an area shuttle for a fee. Multilingual staff at the front desk are standing by 24/7 to help with dry cleaning/laundry, luggage storage, and tours or tickets. Other amenities at this adults-only property include a nightclub, a health club, and 2 spa tubs. Dear Anonymous, thank you so much for giving us the opportunity to host you and for your review. We look forward to host you very soon for an unforgettable getaway! Dear Anonymous, thank you so much for giving us the opportunity to host you and for your review. We look forward to provide you a Magnifico service very soon! Dear Anonymous, thank you for reviewing our resort. We are delighted to know you have enjoyed our grounds, and we look forward to host you once more to deliver the Magnífico service you have come to expect from us. Dear Anonymous, thank you so much for your rating! We look forward to host you soon! Dear Anonymous, thank you for giving us the opportunity to host you and for your review. Yours is the kind of experience we thrive to provide to our guests, and we look forward to host you very soon! Dear anonymous, thank you for your rating. We are always ready to improve, and we remain at your disposal for any suggestions you may have for us regarding our service delivery. Kindest regards! Dear Nati, Thank you for joining us and for your review. We are happy to know that your overall experience was very positive. On the other hand, we apologize for the hiccups you might've encountered during your stay with our culinary options. We look forward to welcoming you back, to enjoy the enhancements and a totally magnífico time. Dear Brian, thank you for your comments. We appreciate that you recommend us, and we look forward to host you once more very soon. Kindest regards! Silk City - Restaurant specializing in Asian cuisine and serving dinner. Coquete - Fine-dining restaurant specializing in French cuisine and serving dinner. Spumante - Theme restaurant specializing in Italian cuisine and serving dinner. Picante - Fine-dining restaurant specializing in Mexican cuisine and serving dinner. Spoon - Buffet restaurant specializing in international cuisine and serving breakfast and lunch. 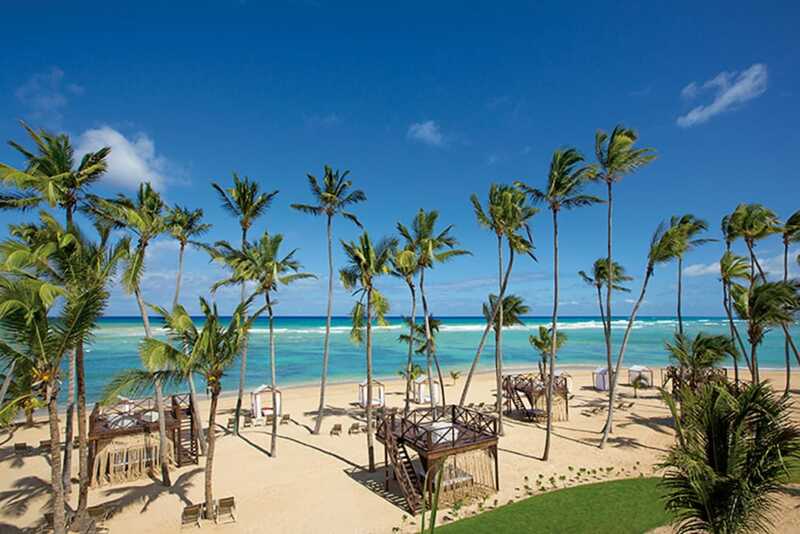 Breathless Punta Cana Resort & Spa Adults Only All Inclusive features outdoor tennis courts and a health club. The property has 8 outdoor swimming pools and 2 spa tubs. Other recreation options include a sauna. The nearest major airport is Punta Cana (PUJ-Punta Cana Intl. ): 45-min drive, 28.3 mi/45.6 km.